The Molecular Biosensor and Imaging Center at Carnegie Mellon University is a collaboration of biologists, chemists, and imaging scientists developing fluorescence technologies for biomedical applications. MBIC is an innovative research environment that focuses on development and application of new scientific tools. MBIC technologies are used in drug discovery, neuroscience, biomedical imaging and cancer biology programs through a variety of partnerships. 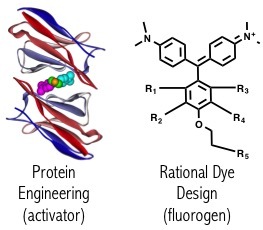 Technologies launched from MBIC include the Cyanine Dyes (Cy3, Cy5, Cy7), High Content Screening (Cellomics, Inc), Difference In-Gel Electrophoresis (DIGE), Qdots for In-vivo imaging, Fluorogen Activating Proteins, and DNA Nanotags. 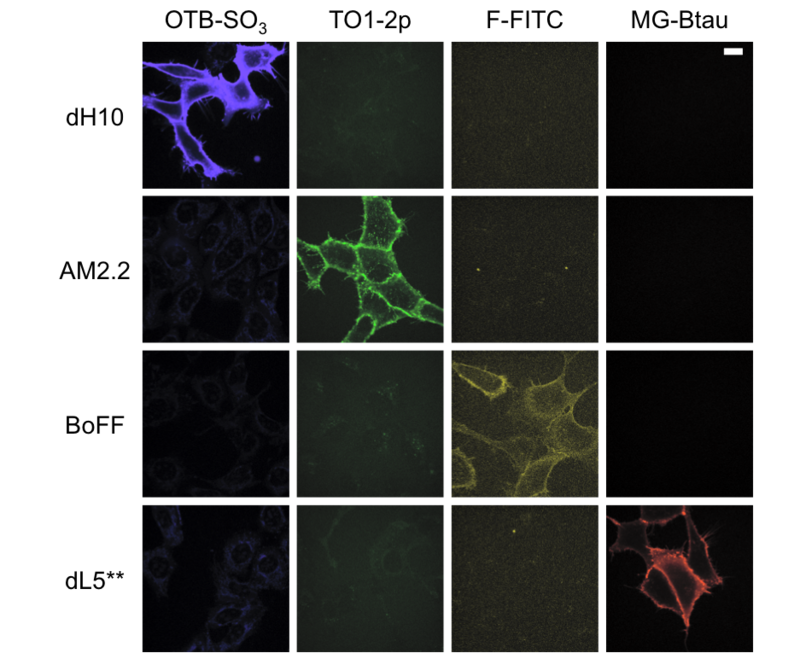 Multiple FAP clones can bind to distinct fluorogenic dyes without cross-reactivity, a set of orthogonal FAP-fluorogen pairs. Szent-Gyorgyi, C.S. et al. (2008) Nature Biotech. Zanotti, K.J. et al. (2011) Org. and Biomol. Chemistry. Saurabh, S. et al. (2015) ACS Nano. Ackerman, DS, Altun, B, Kolodieznyi, D, Bruchez, MP, Tsourkas, A, Jarvik, JW. Antibody-Linked FAPs for Antigen Detection and Cell Ablation. Bioconjug. Chem. 2018; :. PubMed PMID:30543409. Tan, X, Bruchez, MP, Armitage, BA. Efficient Cytoplasmic Delivery of Antisense Probes Assisted by Cyclized-Peptide-Mediated Photoinduced Endosomal Escape. Chembiochem. 2019; 20 (5):727-733. PubMed PMID:30452106. Shelke, SA, Shao, Y, Laski, A, Koirala, D, Weissman, BP, Fuller, JR, Tan, X, Constantin, TP, Waggoner, AS, Bruchez, MP, Armitage, BA, Piccirilli, JA. Structural basis for activation of fluorogenic dyes by an RNA aptamer lacking a G-quadruplex motif. Nat Commun. 2018; 9 (1):4542. PubMed PMID:30382099. Stensrud, KF, Zanotti, KJ, Waggoner, AS, Armitage, BA. Spectral Properties of Fluorogenic Thiophene-derived Triarylmethane Dyes. Photochem. Photobiol. 2019; 95 (1):406-410. PubMed PMID:30339278. Fouz, MF, Dey, SK, Mukumoto, K, Matyjaszewski, K, Armitage, BA, Das, SR. Accessibility of Densely Localized DNA on Soft Polymer Nanoparticles. Langmuir. 2018; :. PubMed PMID:30148639. Tan, X, Bruchez, MP, Armitage, BA. Closing the Loop: Constraining TAT Peptide by γPNA Hairpin for Enhanced Cellular Delivery of Biomolecules. Bioconjug. Chem. 2018; 29 (9):2892-2898. PubMed PMID:30130094. MBIC investigators in the news and MBIC related seminar and event announcements. MBIC provides an on-line booking system for shared equipment and resources. To obtain a user account please contact either Haibing Teng, or Yehuda Creeger.